The people of Block Island know her as Nicole Jones. She hasn't left there in fifteen years. She lives off the grid: no drivers license, no passport, no bank account, and she certainly doesn't have a computer. She's hidden away from the world, and that's exactly what Nicole likes. Then those long ago days as one of the best computer hackers around rise from their grave. A man from Nicole's past-- the very last person she ever wanted to see-- gets in contact, and her carefully constructed life starts to fall apart. Now Block Island is a prison, and Nicole is going to have to dust off those hacker skills in order to escape. 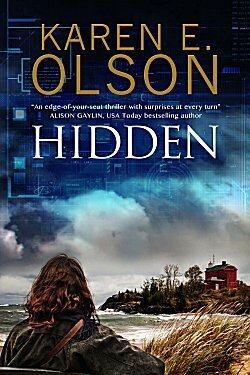 Having become acquainted with Karen E. Olson through her Tattoo Shop mysteries set in Las Vegas, I was looking forward to reading Hidden, which is certainly a departure for this author. I found it to be suspenseful and at times beautifully written-- particularly in those scenes when Nicole is painting on the beach. This person in Nicole's past wants revenge, and we find out why in a series of flashbacks as her life becomes increasingly complicated and fraught with danger. Olson's setting of a small island off the coast of Rhode Island adds to the feeling of claustrophobia and tension. Although I tend to enjoy books with intelligent female main characters who can think on their feet, I found Hidden slow going. I was slow to warm up to the story, and I never did warm up to Nicole. Even though the book has an ending that should make readers want more, I have to admit that my lukewarm reception of Nicole means that I am the exception instead of the rule. This is definitely a case of a well-written book that's just not my cup of tea.